Paleo Pumpkin Latte is a quick and satisfying pick-me-up. It’s also a great breakfast! This Vegan latte uses non-dairy milk, such as coconut or almond milk. 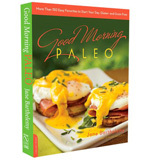 It’s also a Paleo recipe, free of sugars, gluten, grains, processed ingredients, GMO’s, and extracted oils. Real original whole foods are satisfying, flavorful, and healthy for the body. Frankenfoods are low in nutrients, with less flavor, but far more profitable to sell. Starbucks sells millions of Pumpkin Spice Lattes. I wonder what their ingredients are? Uh oh! Below is the “improved” Starbucks recipe as of 2015. It contains cheap GMO beet sugar and GMO-fed milk. Not good. How do we know StarBucks is using GMO beet sugar? GMO beet sugar costs less than cane sugar, and is labeled simply as “sugar”. This is a sneaky way to cover up cheap ingredients. Since cane sugar is seen as more desirable, manufacturers spending the extra dollars will spell out “cane sugar”. When you see “sugar” on an ingredient label, you can assume it is the cheap GMO beet sugar. Regarding milk, here in the US, all milk can be from GMO-fed cows unless labeled organic. Stay Away from Starbuck’s Pumpkin Spice Latte. GMO ingredients marked in red. Espresso, milk [GMO], Pumpkin Spice Flavored Sauce (Sugar [GMO], Condensed Skim Milk [GMO], Pumpkin Puree, Contains 2% or Less of Fruit and Vegetable Juice for Color, Natural Flavors [GMO], Annatto (Color), Potassium Sorbate (Preservative), Salt), Whipped Cream (Light Whipping Cream [Cream [GMO], Mono and Diglycerides, Carrageenan]), Starbucks Vanilla Syrup (Sugar [GMO], Water, Natural Flavors [GMO], Potassium Sorbate (Preservative), Citric Acid), Pumpkin Spice Topping (Cinnamon, Ginger, Nutmeg, Clove). Homemade Pumpkin Spice Latte is cheaper, quicker, tastier, and way more nutritious than Starbucks. Try it! Serves one. 1 tablespoon sweetener to taste, such as Just Like Sugar Table Top natural chicory root sweetener, or 1/2 teaspoon PureLo Lo Han Sweetener by Swanson, or 2 teaspoons raw honey, or your favorite sweetener. Place all ingredients in a blender and whiz. Enjoy! Canned pumpkin will work just fine. I suggest fresh pumpkin or squash as they possess a higher level of nutrient life force. Squash is a delicious substitution for pumpkin. If you don't have Pumpkin Pie spice, mix your own with cinnamon, cardamom, ginger, allspice, cloves, and nutmeg.